Figure 1. Princess Place Drive in Wilmington. Credit: Map data © 2013, Google, North Carolina (http://goo.gl/maps/Y3dxR). Princess Place Drive (SR 1301) is an important bicycle corridor parallel to Market Street, but bumpy road conditions and inadequate facilities made it unsafe for bicyclists. The Princess Place Drive resurfacing project with new bike lanes ran from US 17 Business to 17th Street for about 2 miles. Princess Place intersects Market Street (US 17 Business) to the east and then parallels Market Street traveling west towards downtown Wilmington. The area is mostly residential, with some commercial development, which generates foot and bicycle traffic from people traveling from the residential neighborhoods to businesses located on Princess Place, Kerr Avenue, and Market Street (US 17 Business). 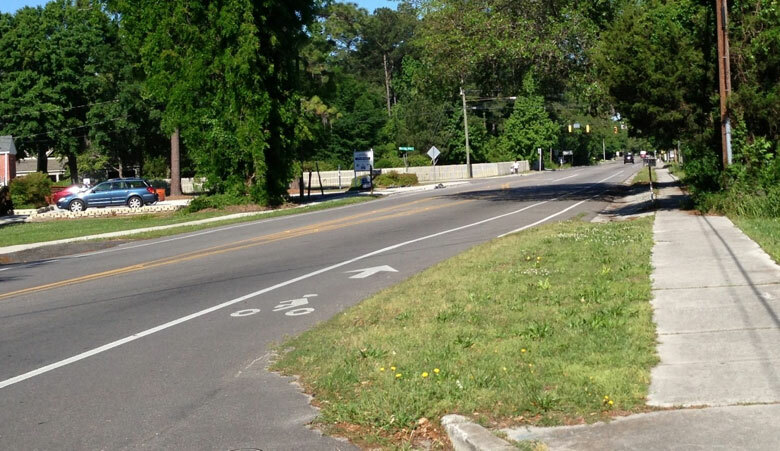 Wilmington MPO identified a need for bike lanes along Princess Place and coordinated with Division 3 staff to implement this with the ongoing milling & resurfacing project. Figure 2. Location of Princess Place in Wilmington, New Hanover County (Left) and Wilmington in North Carolina (Right). The goal of the project was to provide an alternative bicycle facility parallel to Market Street. 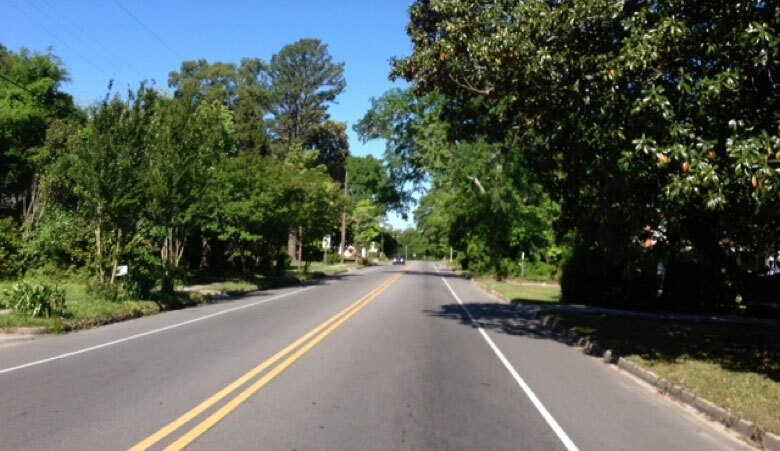 The approximate 2 mile resurfacing was part of a larger, nearly $4 million contract let by the North Carolina Department of Transportation (NCDOT) in late 2009 to resurface about 21 miles of roads in New Hanover and Brunswick counties. Figure 3. A westward view of Princess Place Drive with bicycle lanes marked, near the intersection with Barclay Hills Drive. In Dec 2009, the Wilmington Urban Area Metropolitan Planning Organization (MPO) passed a resolution approving bike lanes on Princess Place Drive. 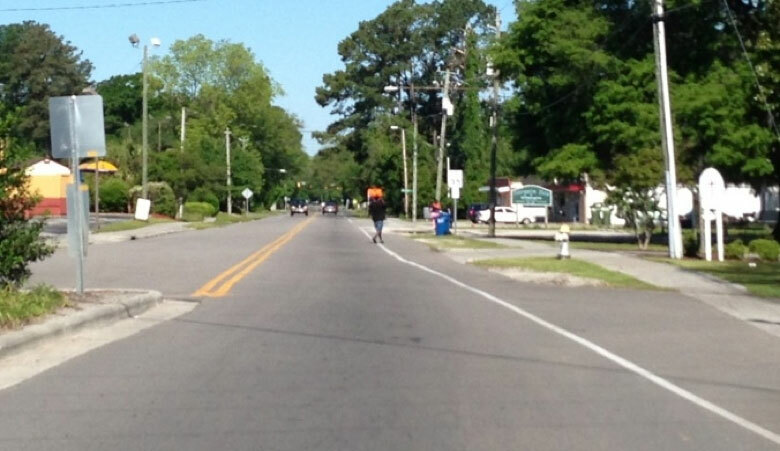 The City of Wilmington worked cooperatively with NCDOT, both with the engineering division and the Bicycle and Pedestrian division, throughout the resurfacing project to develop pavement marking plans for the on-road bicycle lanes. The MPO also worked closely with the MPO’s Transportation Advisory Committee. The contract availability date was January 4, 2010. In April 2010, the pavement marking plans were finalized by Ramey Kemp & Associates. Staff had held public meetings by September 2010 and found that meeting attendees supported the project. 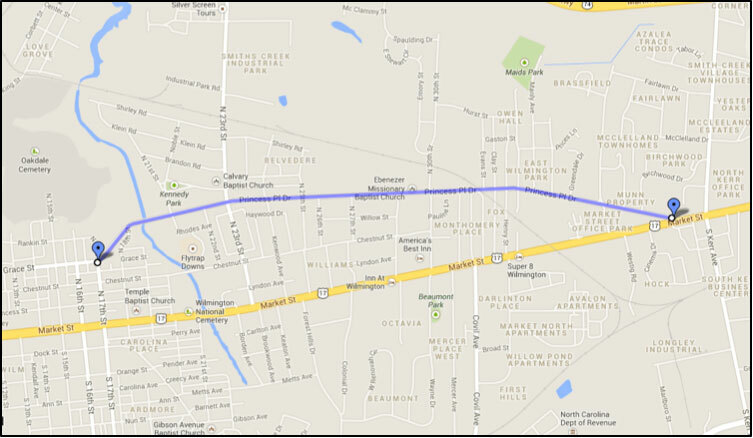 The final plans were submitted to NCDOT, and mill patching began on Princess Place Drive. Figure 4. An eastward view of Princess Place Drive with bicycle lanes marked, near the intersection with Barclay Hills Drive. During the construction phase, the project was delayed for several months due to cold weather, additional paving added by NCDOT, and the unforeseen replacement of old sewer lines. According to Patrick Riddle, NCDOT Division Planning Engineer, during the milling operation, road workers encountered issues with the sewer line, among other issues. The contractor moved to another roadway in the contract, while the utility authority repaired the sewer line. In the meantime, the City of Wilmington approached NCDOT with the possibility of revising the pavement marking on Princess Place. Both parties worked out a pavement marking plan. When the contractor returned to Princess Place, it was near the end of the calendar year, and temperatures were too cold to place the final layer of asphalt. The contractor returned in spring 2011 to complete resurfacing of Princess Place, and the project was completed on April 30, 2011. The project was funded by Division Resurfacing funds. 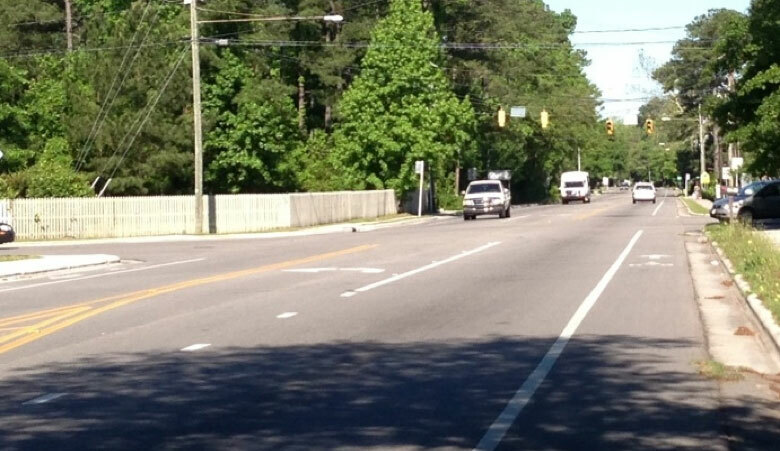 For the work on Princess Place Drive, located in New Hanover County, the total cost was $861,910.88. Figure 5. A view of Princess Place Drive, looking westward toward the Cape Fear River. This section of Princess Place Drive does not have bicycle lanes marked. Photo taken near the intersection of Princess Place Drive and Market Street. The road was resurfaced and much of the street was re-striped to create bike lanes. Constraints on roadway width precluded the entire roadway from getting bike lanes. After project completion, Princess Place Drive accommodated two motor vehicle lanes, two bicycle lanes, and intermittent left-turn lanes (WMPO, Sept 2010). The resurfacing project produced bicycle lanes that are now clearly delineated along Princess Place Drive. Please see the pictures below for examples of the improvements to Princess Place Drive. Anecdotal evidence indicates that a noticeable number of cyclists use Princess Place Drive as a bicycle-oriented alternative to Market Street. Representatives from the Wilmington MPO have not received much feedback from the public concerning the Princess Place improvements. Vehicle traffic volumes have remained relatively constant before and after the road improvements. Located mostly in residential neighborhoods, Princess Place has experienced few commercial changes since the addition of bike lanes. Figure 6. An eastward view of Princess Place Drive near the intersection with North 29th Street. This section of Princess Place Drive does not have bicycle lanes marked. While the project was mainly bicycle-oriented, there were some improvements for pedestrians as well. Crosswalks and curb ramps were added at the intersection of Princess Place with 23rd. Princess Place had other pedestrian improvements planned but due to the last minute marking plan submissions, the pedestrian improvements were not included. Wilmington MPO officials now have an improved process in which all plans are organized and included in the contract far in advance of project letting, saving time and money for the MPO, and improving conditions for road users. Riddle, P. (2013, October 4) Discussion of Princess Place Drive Resurfacing Project.